On the night of Feb. 27, unidentified armed men seized the buildings of the parliament and cabinet of ministers in the southern Ukrainian region of Crimea. Russian flags have been hoisted over both buildings. The action indicates that the confrontation between the supporters and opponents of the change of government in Kiev has shifted from the Ukrainian capital to Crimea. 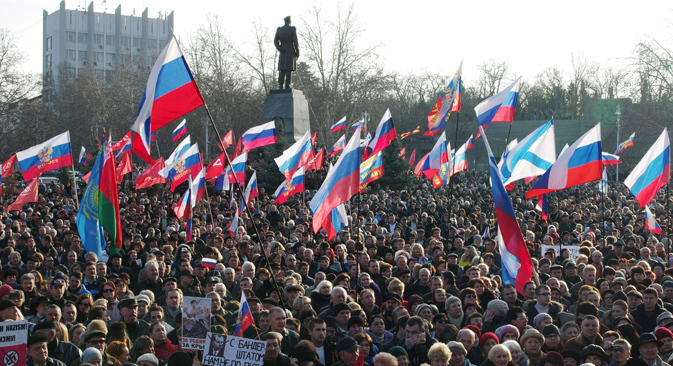 Outside observers fear that the action in Crimea could indicate the first step in the break-up of the country. During its long history, Crimea has belonged to various countries and for a while was even independent. In 1441, Crimea became an independent stare ruled by a Tatar Khan, but its independence did not last long. In 1475 the Khan became a vassal of the Ottoman Empire. For three centuries, the Crimean Tatars were ruled by the Ottomans, although they had broad autonomy. They protected the Ottoman Empire from attack from the north, and ensured a constant influx of slaves. In 1774, after yet another Russian-Turkish war, the Crimean Khan became the vassal of the Russian rather than Ottoman empire. Up until 1944, Crimea had a mixed Russian and Tatar population. It was occupied by the Germans on two occasions (in 1918 and in 1941-1944). During the Bolshevik Revolution the Tatars tried to restore their independent state, but in the end, Crimea became part of Soviet Russia. The government in Moscow favored the Tatars, and the peninsula became an autonomous republic. But after World War II and the German occupation, during which the Tatars collaborated with the Germans, they fell victim to Moscow's wrath and were deported to the east. In 1954, Crimea was stripped of its status as an autonomous republic and was made an administrative part of Ukraine. The decision was made in honor of the 300th anniversary of the Pereyaslav Council, which approved the reunification of Ukraine and Russia. In truth, however, Crimea's geographic location had much to do with the move. It is easier to run the peninsula from Kiev than from Moscow. In the 1990s there was a lot of tension in and around Crimea. After independence, Ukraine tried a policy of Ukrainization of the peninsula, which caused a lot of resistance among the local population. The Tatars, who were given the right to return to Crimea, tried to use the turmoil to restore their lost lands and privileges. The most contentious issue was the main base of the Soviet Black Sea Fleet in Sebastopol. In the end, Crimea did not break away from Ukraine, but it was given special privileges. Of all the Ukrainian provinces, it is the only one that has the status of an autonomous republic. Crimea was essentially permitted to remain Russian. The changes were largely cosmetic, such as new street signs in Ukrainian. The area remained fairly calm until the most recent crisis. There are two important factors to consider when discussing the future of Crimea: the ethno-cultural, and the economic. Crimea is the most Russian part of Ukraine. Its population is 58 percent ethnic Russian, 24 percent Ukrainian, and 12 percent Tatar. Russian is the mother tongue for three quarters of Crimeans. Only 10 percent say their mother tongue is Ukrainian. According to the Kiev International Institute of Sociology, 97 percent of Crimeans speak Russian. Crimea does not have an economic elite oriented towards Europe. Its economy was devastated over the years of Ukrainian independence. In the late 1990s, Ukrainian oligarchs grabbed many of the most lucrative Crimean resorts, and even began to invest some money into them, but there was not significant investment in the region. For both cultural and economic reasons, Crimea could not remain indifferent to the situation in Kiev. The first reaction of the local population was anger, the second – a demand to restore order. The upsurge in tensions that coincided with the 360th anniversary of the Pereyaslav Council and the 60th anniversary of Crimea being made part of Ukraine has now triggered an entirely official reaction. The first scenario is that things will somehow settle down of their own accord. However, the only person that seems to believe this is Viktor Yanukovych. The chances of that scenario coming to pass are slim. The second scenario is that Crimea will receive even broader autonomy from the new goverment in Kiev. This scenario will come to pass only if some degree of stability is restored - and that will only be possible if the parties agree to the federalization of Ukraine. But supporters of Ukrainian independence are afraid of federalization. The third scenario is that Crimea will break off from Ukraine and becoming another “unrecognized state” under Russian protection. Kiev does not have the strength to prevent that, even if a functioning government is restored in the Ukrainian capital. Ukraine does not have especially effective armed forces, and due to the crisis, it has next to no economic leverage remaining either. But such a scenario could trigger a conflict in Crimea itself - a conflict between the Crimean Tatars and ethnic Russians who inhabit the peninsula. Based on materials from Vzglyad.